What your 800 and a woman&apos;s 700 plaque will look like. What your 11 in a row will look like. What your 300 plaque will look like. 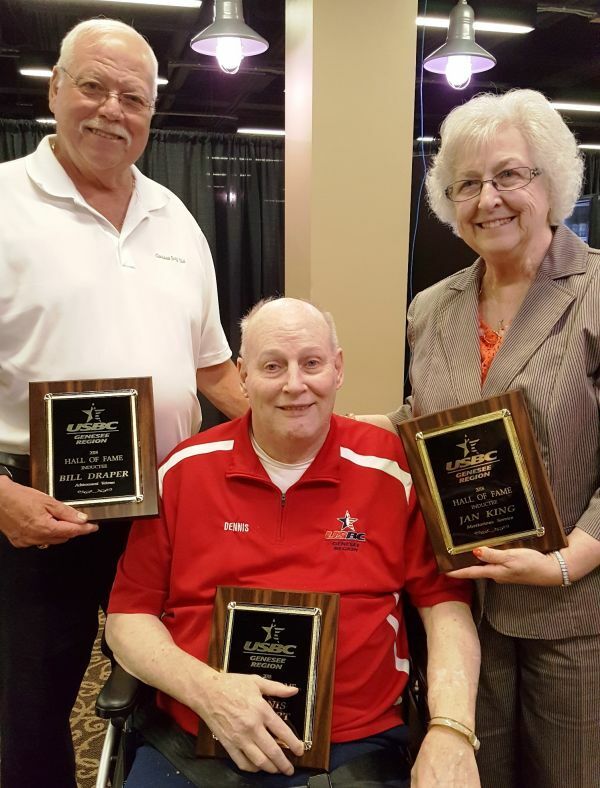 APRIL 19, 2019 -- The Genesee Region USBC Annual Banquet on May 11 at Batavia Downs Gaming will include the induction of four people into the GRUSBC Hall of Fame -- James Foss of Medina in the Achievement Regular category, Robert Hodgson of Medina and Al Vlietstra of Geneseo in the Achievement Veteran category, and Eunice Englert of Nunda in the Meritorious Service category. Foss, 56, has been a standout bowler for the past 20 years, compiling more than 15 300 games and six 800 series and averaging over 200 for most of those year – with a high of 235. In 2007-08, he earned national recognition for have the high trio series of 2,295 (two men and one woman). 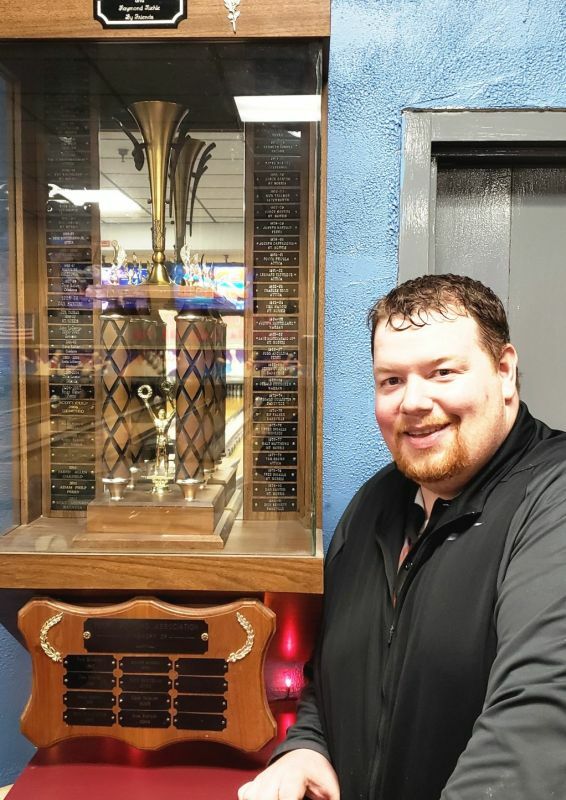 The head mechanic at Medina Lanes and league officer for several leagues, he has cashed in numerous local tournaments in the Medina, Lockport and Genesee Region associations. He finished second to Rich Wagner in the GRUSBC Masters in 2017, averaging 206 while winning six of eight matches in the final en route to a $325 prize. He also has been a finalist on multiple occasions in the GRUSBC Senior Masters. Hodgson, 71, a retired school teacher, has 13 perfect game and seven 800 series while averaging in the 215-plus range for the past several years. His tournament success includes victories in the GRUSBC Doubles event with his son and the Tommy Kress 60-and-Over scratch singles tour. A certified bowling coach, he assists with the Saturday morning youth program at Medina and consistently competes in GRUSBC tournaments. Vlietstra, 70, has done well in tournaments at the local and state level. He is a two-time Singles champion, with 762 in the Perry Association in 1997 and 860 (752 scratch) in the GRUSBC in 2017. He placed first in the 2009 GRUSBC Senior Masters at Letchworth Pines and rolled his high game of 299 in an Amateur Bowlers Tour event. -- Handicap Doubles (801 with handicap) in the 2015 NYS Open Championships in Buffalo. His personal best series of 788 came in the New York State Firemen’s Tournament in Newburgh in the mid-2000’s. A league bowler since 1987, he posted his high league average of 203 in 2004-05 at Perry Bowling Center. Englert has been bowling for more than 50 years and has served the sport as a league secretary, Genesee Valley Women’s Bowling Association director and tournament coordinator for almost as long. Her induction comes on the heels of her husband’s (Dennis) enshrinement last year. The couple was a fixture at Letchworth Pines, running the bowling center and taking care of the leagues for 30 years. LEAGUE CHAMPION: The Rose Garden II team won the Genesee Region Youth Travel League title this season. From left are Sawyer Zinter, Megan Jarkiewicz, Evan Phillips and Brendan Pimm. MARCH 31, 2019 -- The 13th annual Genesee Region USBC Association Tournament concluded this afternoon at Oak Orchard Bowl in Albion (Team event) and Medina Lanes (Doubles & Singles events). The Genesee Region USBC contributed $650 in added money to the prize list, bringing the total prize fund to $8,379 -- $1,700 more than last year. Thirty-five teams competed in the two divisions (Open and Women), the same number as last year, but Doubles went up from 39 to 58 and Singles increased from 85 to 115. The GRUSBC wishes to thank the management and staff of Oak Orchard Bowl and Medina Lanes for hosting the tournament. CLICK HERE for unofficial standings through the completion of the tournament. CLICK HERE for the projected prize list. The GRUSBC has 30 days to verify all standings and pay out the prize fund. MARCH 25, 2019 -- One hundred years ago today, John Cipolla, Genesee Region USBC director, was born. Cipolla is a Nunda resident and longtime league bowler at Mount Morris Lanes. Please join us in wishing John a Happy 100th Birthday! 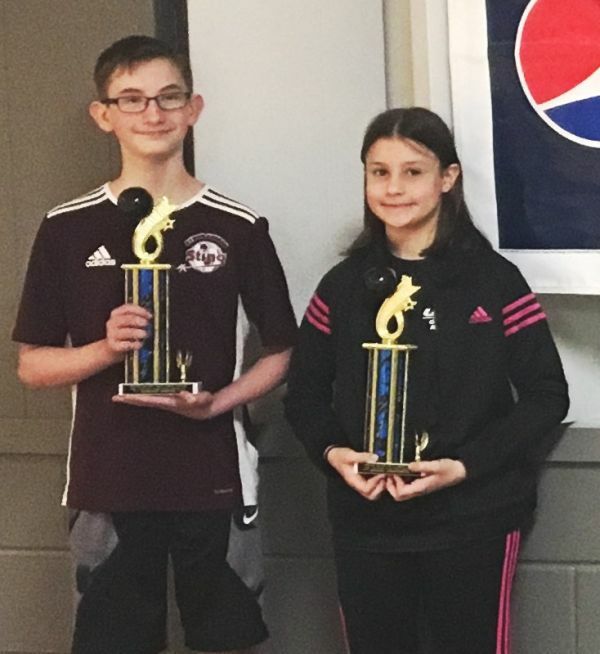 MARCH 22, 2019 -- The Rose Garden II team of Evan Phillips, Sawyer Zinter, Megan Jarkiewicz and Brendan Pimm placed first in the Genesee Region Youth Travel League that concluded its regular season on March 10 at Legion Lanes in Le Roy. The winning team posted a 149-67 record to outdistance second-place Perry Bowling Center by 16 points. Oak Orchard I placed third another 4.5 points back. In final week action, Aaron Leone of Le Roy Legion Lanes led the way with a 245 game and 614 series while Devon Zinter of Rose Garden I had 237—543 and Dallas Ecker of Oak Orchard I had 213—526. Individually, Dennis Van Duser of Perry had the high average for boys with 196 and also had the high scratch game of 257 and high scratch series of 706. Samantha Hyde of Le Roy led the girls with a 174 average, 223 scratch game and 594 scratch series. Van Duser also had the high series with handicap (781) while Pimm had the high game with handicap (289). Jarkiewicz had high game with handicap for girls (274) and Paige Snook of Oak Orchard II had the high series with handicap for girls (731). The league wraps up with a no-tap tournament and banquet at 1 p.m. this Sunday at Rose Garden Bowl in Bergen. 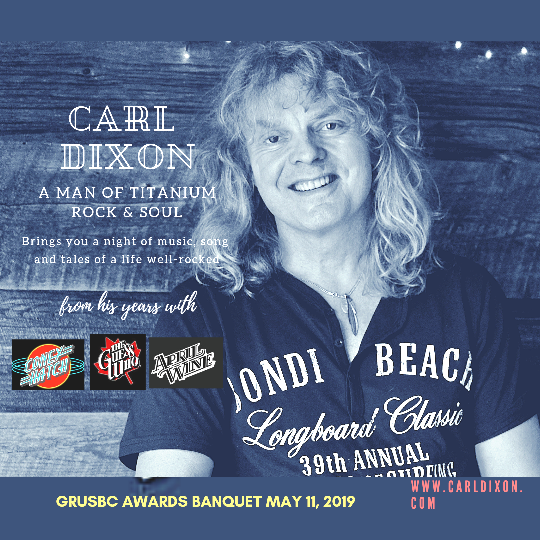 MARCH 8, 2019 -- Legendary Canadian rock musician Carl Dixon will share the inspirational story of his miraculous recovery from a horrific car accident as the keynote speaker at the Genesee Region USBC's Annual Banquet on May 11 at Batavia Downs Gaming on Park Road. The event will begin at 6 p.m. sharp. Tickets for the banquet are $30 and can be obtained by calling 585-343-3736 or sending an email to mikep@bowlgr.com. CLICK HERE for more information and ticket cost details. Dixon, a Sault Sainte Marie, Northern Ontario native, was signed to his first international record deal at just 22-years old with his break through band CONEY HATCH. He toured North America opening for IRON MAIDEN for 40 shows and JUDAS PRIEST for 27 shows. Carl went on to tour with some of the biggest names in North American music. He became lead singer of THE GUESS WHO after Burton Cummings left the iconic Canadian band. Carl held that position for eight years until his head on car accident in Australia. It was 2008 when Carl took leave from The Guess Who to sort out family issues in Australia but the stress took its toll. Distracted and worried while driving at night Carl was involved in a horrific head on car collision in rural Victoria. He sustained 52 injuries including traumatic brain injury, crushed legs and crushed internal organs. Trapped in the mangled car for one hour and forty-five minutes there seemed little hope. Remarkably, ten years on, Carl Dixon is walking tall. His rescue by dedicated volunteers and emergency surgeons and staff in Australia is the stuff of legends. His unlikely survival was followed by family and business difficulty. When the dust settled his business was in tatters and he was left with a mountain of debt. Doggedly Carl returned to doing what he loves: music. His injuries caused him to rethink his approach and Carl became an author and inspirational speaker sharing his survival story. Ten years on from his accident Carl sings better than ever, he's re-branded his business to six figure success, he’s a published author, had a triumphant return to THE GUESS WHO as special guest and returned to touring with CONEY HATCH. Carl's story of rebuilding his life and coping with traumatic brain injury is inspiring, remarkable and entertaining with a capital E! Join a legend of Canadian rock as he weaves his story in words and music. MARCH 8, 2019 -- Oak Orchard Bowl in Albion and Medina Lanes will be hosting the 13th annual Genesee Region USBC Association Tournament on March 23-24, 30-31. The team event will take place in Albion with squad times at noon and 3 p.m. on Saturday, March 23 and Sunday, March 31 and 3 p.m. on Sunday, March 24 and Saturday, March 30. CLICK ON THE TOURNAMENTS/RESULTS TAB FOR AN ENTRY FORM. Doubles and singles events will be held at Medina Lanes with squad times at 11:30 a.m. and 3 p.m. each day. Squads have been set up so that bowlers driving from the southern part of the association (Wyoming and Livingston counties) will be able to bowl the Team, Doubles and Singles on the same day if they so choose. Competition will consist of four-person Teams in two divisions – Open or Women – and Doubles and Singles in the same two divisions. Handicap is based on 90 percent of the difference in the bowler’s average and 215, using a bowler’s highest USBC league average for the past three seasons (at least 21 games per league). The entry fee is $30 per person per event, with optional All-Events priced at $10. The tournament is open to current GRUSBC members who have bowled at least 21 games in at least one league during the 2017-18 or 2018-19 season. For more information or to sign up for a squad, send an email to mikep@bowlgr.com. 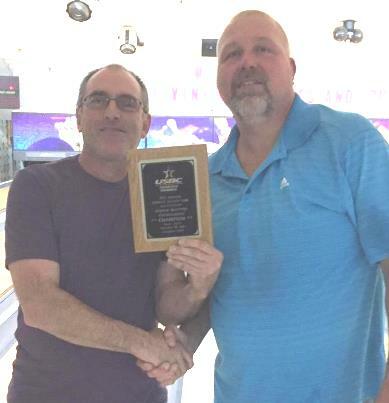 CREAM OF THE CROP: Curtis Foss of Medina, left, receives the champion's plaque from Paul Spiotta, tournament director, following his victory Sunday in the Genesee Region USBC Masters at Scopano's Lanes in Oakfield. Foss now has five Masters titles, breaking the tie with Dave Montemarano Jr. of Batavia and Tim Rohl, formerly of Le Roy, for the most ever. 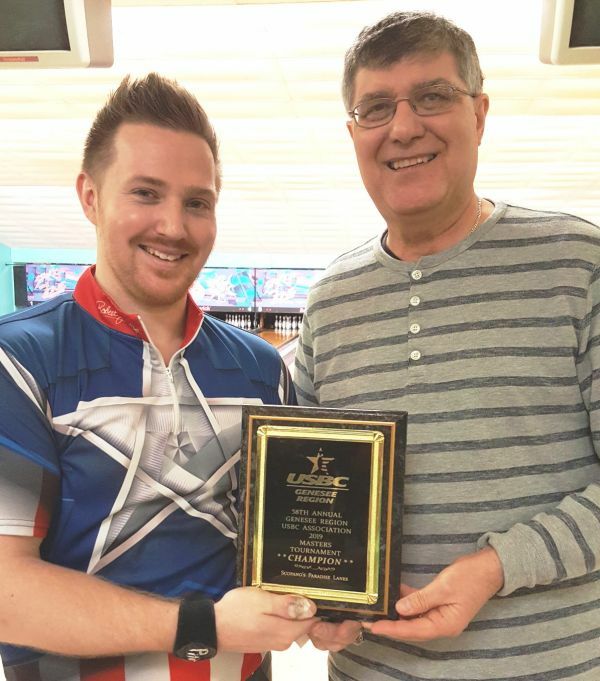 FEBRUARY 11, 2019 -- Setting a new standard for bowling excellence in the Genesee Region, Medina’s Curtis Foss captured an unprecedented fifth GRUSBC Masters Tournament crown Sunday in record-setting fashion at Scopano’s Lanes in Oakfield. Foss, whose commitment to the sport in this area is second-to-none, averaged 254 during the eight-game match play finals yesterday and compiled 722 Peterson Points – both high-water marks in the event’s 58-year history. CLICK HERE for finals statistics. The 31-year-old right-hander entered the finals as the No. 1 seed based on his 1,030 score for four games of qualifying the day before (a 257.5 average) and picked up right where he left off by rolling back-to-back 269 games on Sunday. First he defeated second-seeded and former champion Scott Culp of Honeoye Falls, 269-223, and then he knocked off third-seeded and defending champion Kevin Gray Jr. of Warsaw, 269-213, to leave little doubt as to who would emerge victorious. He coasted from there, posting scores of 226, 245, 245, 246, 277 and 255 – losing only to Jake Rosenbeck of Medina, 268-245 in game four. Foss earned $320 and a champion’s ring for his efforts, adding to his collection as a result of victories in 2008, 2009, 2014 and 2015. In league play this season, Foss -- who bowls as a regular or sub every day of the week -- has registered five 800 series and four 300 games, and already has 27 800's and 40 300's for his career. Rosenbeck, a 32-year-old righty, enjoyed a successful Masters debut, placing second with 450 Peterson Points and averaging 231 for his 12 game. He earned $240. Gray finished in third place with 291 points, followed by Scott Allis of Medina (278), Culp (205), Mike Johnson of Batavia (185), former champion Tom Rohl of Le Roy (146) and Mike Pettinella of Batavia (64). In Peterson Point match play, bowlers receive 30 points for a victory and more or less points for their score in relation to 200. Foss, 1,030; Culp, 963; Gray Jr., 942; Allis, 919; Rosenbeck, 911; Johnson of Batavia, 910; Rohl, 892, Pettinella, 887. Devon Leach of Stafford was the alternate at 874. 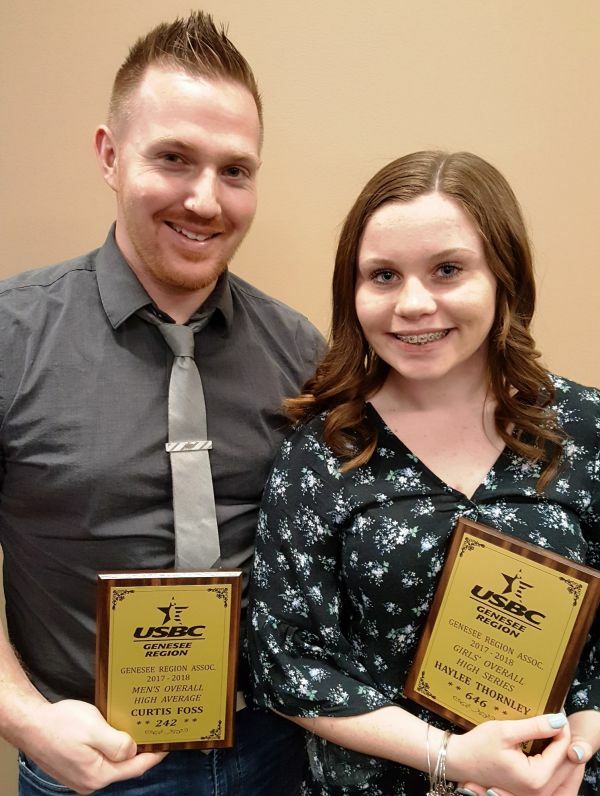 JANUARY 22, 2019 -- Perry's Matt Slocum bowled with his daughter and son at the 2019 Genesee Region USBC Adult-Junior Tournament at Rose Garden Bowl in Bergen and both of them went home smiling. Slocum and Allie Faryna posted 1,390 to take first place and he and Gavin Slocum registered 1,342 for second place in the 12-and-Under Division. As a result, Allie's scholarship account is $220 richer and Gavin's increased by $180. Two other duos cashed in that division of the Jan. 11-13 tournament -- Albion's Reid Cole (adult) and Kyle Brett, 1,341, for $140, and Mount Morris' Chad (adult) and Dominic LaPiana, 1,301, $100. In the 13-and-Over Division, Jerry Menzie Jr. teamed with his little sister, Jillian, for a remarkable 1,575 score to take the $240 first place prize. Other cashers were Dave DiSalvo (adult) and Trent Willis of Mount Morris, 1,493, $210; Paul Baney (adult) and Gavin Baney of Holley, 1,416, $180; Dan Santini (adult) and Alexis Patterson of Mount Morris, 1,394, $150, and Tom Fluker (adult) and Tony Sprague of Batavia, 1,361, $120. Adults were entitled to their prize money unless they opted to have it placed in the youth's scholarship account through USBC SMART. The tournament drew 44 teams. JANUARY 8, 2018 -- In a rematch of a major Genesee Region USBC tournament finals less than a year ago, Kevin Gray Jr. of Warsaw once again defeated Rich Wagner of Batavia, this time on Sunday by a 226-187 score to capture the GRUSBC Scratch Memorial at Livingston Lanes in Geneseo. Gray, 37, rallied from a 16-pin deficit by stringing four strikes in frames seven through 10 to close out Wagner in the battle of quality left-handers. The win was worth $650 for Gray, who won this event in 2016. Wagner earned $350. Last February, Gray defeated Wagner, 213-204, in the decisive match to claim the GRUSBC Masters crown, also at Livingston Lanes. Wagner, 36, reached the title match with a 192-181 win over Batavia lefty Brian Green. Prior to that, Green ousted two-time defending champion Scott Culp of Honeoye Falls, 218-216, after edging Nathan Tackentien of Arcade, 216-215. Green pocketed $260, Culp $215 and Tackentien, who rolled 300 in the final game of the semifinals to advance to the stepladder round, took home $160. Other cashers were Brian Weber of Perry ($130), Bob Santini of Mount Morris ($120), Matt Slocum of Perry ($110), Matt Balduf of Batavia ($100), Brett Van Duser of Perry ($100), Ryan Smith of Perry ($100), Mike Pettinella of Batavia ($85), Brady Weber of Perry ($85) and Jeff Wolinski of Perry ($85). Gray registered 1,750 for eight games (four qualifying and four semifinal) to edge Wagner by one pin for the No. 1 seed in the stepadder finals. Wagner was the high qualifier with a 919 four-game total. The tournament was contested on two challenge oil patterns – a 40-foot pattern in the qualifying round and a 45-foot pattern in the semifinals and finals. The next Genesee Region USBC scratch tournament is set for Feb. 9-10 – the Masters at Scopano’s Lanes in Oakfield. SCRATCH MEMORIAL FINALISTS: Stepladder finalists, in order of finish from left, from the GRUSBC Scratch Memorial -- Kevin Gray Jr., Rich Wagner, Brian Green, Scott Culp and Nathan Tackentien. CLICK ON THE TOURNAMENTS TAB AT THE TOP OF THIS PAGE. NOVEMBER 16, 2018 -- The Genesee Region USBC wishes to thank Western Regional Off-Track Betting Corp. (Batavia Downs Gaming) for signing on to be a major sponsor of our association this season. Batavia Downs Gaming, which once again will be hosting our Annual Dinner in May, has contributed $500 to the association in its support of organized bowling. The funds will be used to continue the GRUSBC's popular awards and scholarship programs. SENIOR MASTERS FINALISTS: Ron Bacon, left, of Warsaw and Jim Pursel of Batavia finished 1-2 in the Genesee Region USBC Senior Masters tournament on Saturday in Geneseo. NOVEMBER 13, 2018 -- Ron Bacon of Warsaw defeated Batavian Jim Pursel in the title match to claim the Genesee Region USBC Senior Masters crown on Saturday at Livingston Lanes in Geneseo. The victory was worth $230 plus a free entry into the GRUSBC Masters and a plaque from Joe's Awards & Trophies. Bacon, 54, defeated Pursel 204-132, after Pursel downed Roger Allis of Medina, 189-185, by striking twice in the 10th frame. The tournament drew 38 entries. CLICK HERE for tournament statistics. NOVEMBER 7, 2018 -- The Gladys Ford Senior Women's Tournament took place over the weekend at Letchworth Pines in Portageville. NOTE: LEAGUE ROSTERS ARE UPDATED AS NEW MEMBERSHIP CARDS ARE RECEIVED. SEPT. 7, 2018 -- Seventeen-year-old Matthew Hurlburt, transitioning from a youth bowler to an adult league member, opened the season with a bang Wednesday night by rolling a 300 game in the Wednesday JCI League at Livingston Lanes in Geneseo. Hurlburt, a high-revving lefty, posted games of 300-247-208 for a 755 series. An accomplished youth bowler at Perry Bowling Center, Hurlburt average 198 last season in the Genesee Region Youth Travel League. CLICK HERE for list of averages. CLICK HERE for league abbreviations. CLICK HERE for youth league averages, including GR Travel League. SCHOLARSHIP RECIPIENT: GRUSBC President Tom Fluker congratulates Sam Miller of Le Roy upon being selected as the Barbara Krieley Memorial Scholarship winner. HIGH ROLLERS: Curtis Foss of Medina had the association's high average of 242 while Haylee Thornley of Batavia posted the highest series for girl youth bowlers with 646. TRAVEL LEAGUE CHAMPIONS: The Rose Garden team of Bergen won the GR Youth Travel League this season. From left are Madelynn Pimm, Brooke Jarkiewicz and Devon Zinter. 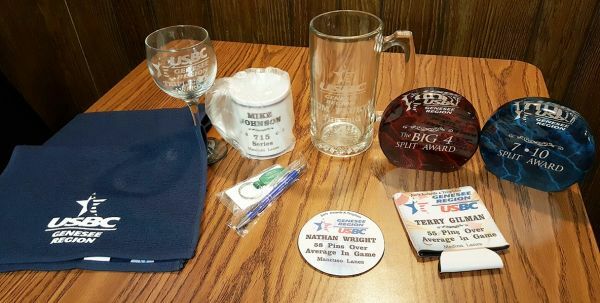 MAY 12, 2018 -- The Genesee Region USBC celebrated a successful 2017-18 bowling season on Saturday night by inducting three people into its Hall of Fame and recognizing association leaders, tournament champions and scholarship recipient. More than 100 people gathered together at Batavia Downs Gaming for the local bowling association's awards banquet, an annual event that also saw GRUSBC President Tom Fluker hand the leadership baton to fellow Batavian Gary Kuchler. Fluker had served on the GRUSBC board for nine years, the last six as president -- and was instrumental in expanding the association's youth, awards and scholarship programs. Kuchler will begin his term as president on Aug. 1. Three incumbent directors were re-elected to the board -- Patricia Fuller of Medina, Steve Krna of Alexander and Sharon Willet of Dalton. Dennis Englert of Nunda and Jan King of Dansville were inducted into the Hall of Fame in the Meritorious Service category while Bill Draper of Livonia was enshrined in the Achievement Veteran category. 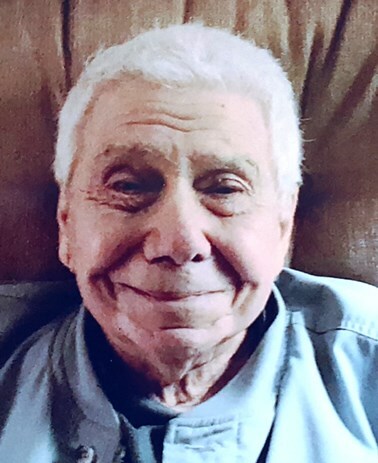 Englert was a longtime bowling manager at Letchworth Pines and an avid bowler, who suffered a life-altering brain injury when pushed to the floor by an irate patron at Letchworth Pines in January 2015. At last night's dinner, he was surrounded by friends and family, including his wife, Eunice, who worked with him for many years at Letchworth Pines. King's induction also was witnessed by several family members and friends, while Draper was accompanied by his wife, Gail, and longtime bowling buddy, Doug Johnston. "I'm truly humbled," Draper said. "When I was a little guy, I never thought that I would make it here. I'm very honored." 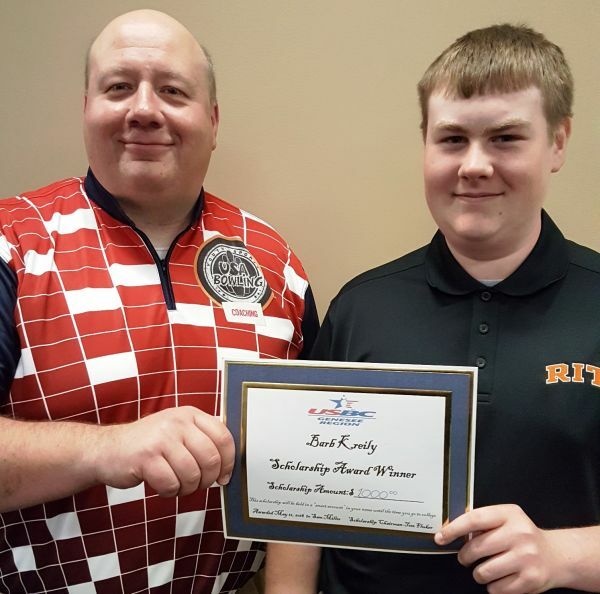 Sam Miller of Le Roy, a standout bowler in the Turnbull Heating Junior League at Mancuso Bowling Center in Batavia and in the Genesee Region Youth Travel League, was selected to receive the Barbara Krieley Memorial Scholarship, a $1,000 award for his scholastic and bowling accomplishments. He will be attending Rochester Institute of Technology in the fall. Association leaders in league play this season were honored as well, including Curtis Foss of Medina, who tied a GRUSBC record by averaging 242 in a league at Oak Orchard Bowl in Albion. 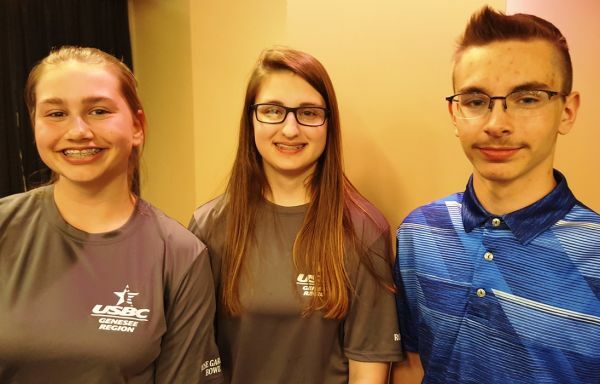 Other 2017-18 adult leaders were Brian Cline of Williamsville, who set an association record with an 858 series; Jackie Jurinich of Medina, 298 game, and Caycee Landers of Brockport, 223 average and 782 series. 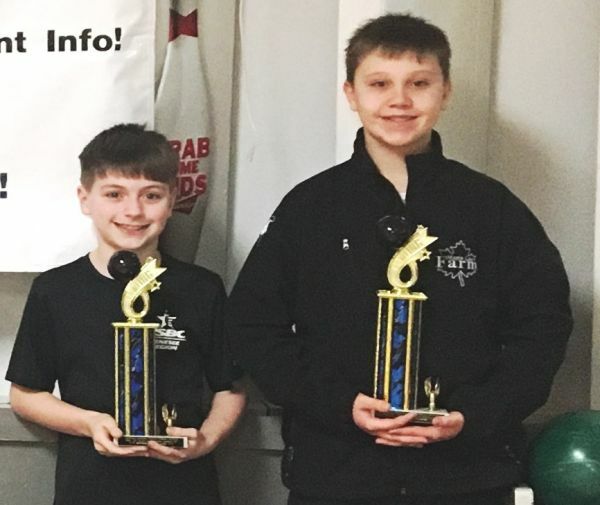 In youth bowling, Brody Brown of Medina, had the high game (289) and series (759) and Alex Allis of Medina had the high average (209) for the boys, while Haylee Thornley of Batavia had the high series (646) and Julia Menzie of Bergen had the high game (266) and average (176) for the girls. The GRUSBC gave away $1,600 through its annual "grand prize drawing" of names of bowlers who earned entries into the drawing through their high scores in league play throughout the season. Winners of $500 prizes were Janet McDonald of Corfu, Diane Hurlburt of Warsaw and Brian Green of Batavia. Four others won $25 each. -- Story and photos by Mike Pettinella, GRUSBC Association Manager. SEPT. 17, 2017 -- While the certification application, sanction cards and dues for all but three previously certified leagues in the Genesee Region USBC have been submitted to the GRUSBC office, it is still imperative that league secretaries make sure that all substitutes fill out cards and pay the appropriate dues. Cards and payment should be sent to GRUSBC, 55 Edgewood Drive, Batavia, NY 14020. If you have questions, send an email to mikep@bowlgr.com. -- $21, Standard -- A bowler who is being certified in a league of more than 16 weeks, and HAS NOT previously certified in any other league, whether in the Genesee Region USBC or another local association. -- $13, Adult Basic -- A bowler who is being certified in a short season (16 weeks or less) league that HAS NOT previously certified in any other league. -- $7, Local Only Adult -- A bowler who is being certified in a league of more than 16 weeks, and HAS previously certified in a league in another USBC association in New York State (example, Rochester or Greater Buffalo). -- $8, Upgrade to Standard -- A bowler who is being certified in a league of more than 16 weeks, who HAS previously purchased an Adult Basic membership. -- $10, Youth -- A youth bowler who is being certified in one of the GRUSBC youth programs. -- $0, -- A bowler who is participating in a league but has already purchased a Standard ($21) membership in another league in the Genesee Region USBC. A card must be submitted to the GRUSBC office, however. CLICK HERE for 2016-17 adult league averages. CLICK HERE for a list of bowlers who paid for 2016-17 in recent weeks. This list does not include bowlers in several leagues who did not pay their USBC membership fees last season. CLICK HERE for a list of youth bowler averages. Note: youth averages from Bennington Lanes were not submitted. AWARDS FOR OUR BOWLERS: The Genesee Region USBC is proud of its awards program, which recognizes bowlers of all ages and all skill levels. Secretaries can submit awards to the association office by clicking on the Links tab at the top of this page and filling out the GRUSBC Online Submission Form. AUGUST 15, 2016 -- When it comes to tournament competition, protecting the integrity of the game is the "name of the game." The Genesee Region USBC is making a renewed commitment to ensuring that all tournament bowlers get a fair shake. Tournament bowlers can rest assured that all entering averages will be scrutinized -- utilizing the tools available per USBC rules. One of those is Rule 17a, which governs tournament management's right to adjust averages prior to competition for a variety of reasons when there is information indicating the bowler's entering average does not represent the bowler's ability. Did you know USBC Rule 17a-2 allows for disqualification of scores when this information is discovered after the player has bowled? According to Rule 17a, the penalty for violating this rule includes loss of games, prize winnings and disqualification. Although disqualification may seem extreme, it is a comfort to the other tournament participants to know tournament management is protecting the integrity of the game. JULY 14, 2016 -- All too often, representatives of the United States Bowlling Congress -- at the national, state and local levels -- are faced with the question from bowlers: "What do we get for our membership dues?" We at the Genesee Region USBC believe that USBC certification is definitely worth the small investment -- a one-time fee of $18 -- and we have put your money to work by developing one of the best award programs in New York State. You can find a list of our awards by clicking on the Downloads tab on this website. Not sure what you get for your membership dues? CLICK HERE for an article on the benefits of USBC membership from Sept. 2014, written by incoming Association Manager Mike Pettinella. CLICK HERE for an outline of the role of USBC at the national level. Note: National dues increased to $13 in 2017-18, the first increase in 12 years. CLICK HERE for a summary of the Adult Basic membership option. For more information, contact us at tfstrikeforce@msn.com.